It’s no surprise that London has its fair share of hotels (1876 according to one online hotel booking site). Options range from boutique luxury hotels and high-end continental big hitters to family B&B’s and budget guesthouses. 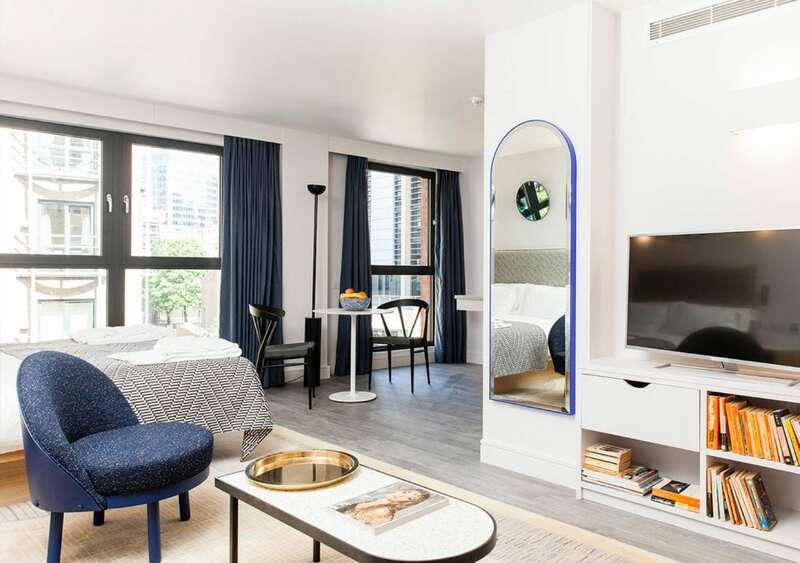 More recently, however, the big smoke has seen a rise in aparthotels, which combine hotel comforts with apartment-style independence. TLE recently visited Rockwell East in East London to test drive the concept. Rockwell East is located around a 20-minute taxi ride from London City airport, making it ideal for those travelling on business. It’s also a five-minute walk from Tower Hill, Aldgate and Aldgate East tube stations, giving tourists looking to explore central London easy access to some of London’s main terminals, including Victoria and Kings Cross. For those looking to get to know Shoreditch (one of East London’s main hipster hubs), the hotel is well-placed – only a twenty-minute walk from Shoreditch High Street. Here you’ll find flanks of restaurants and bars. Spitalfields Market is a particularly good spot for shopping, eating (Café Caribbean) and drinking (Ten Bells). Slightly further away (around a 30-minute walk) is Colombia Road flower market, which every Sunday blooms with street sellers flogging everything from banana trees and sunflowers to mini pineapples and daffodils. 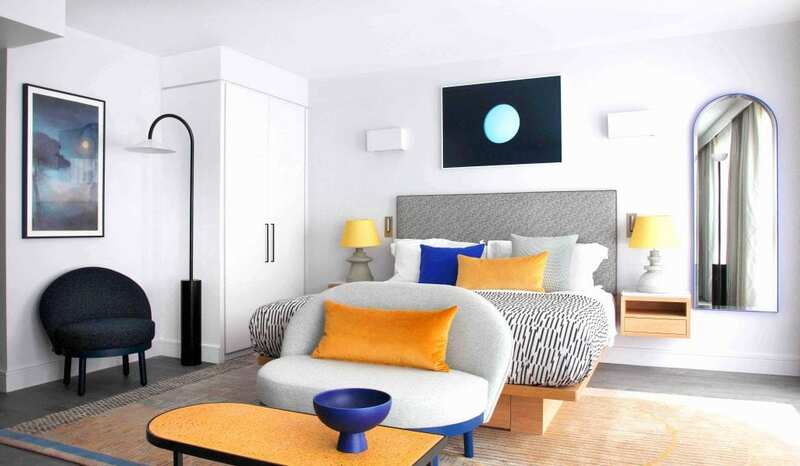 Rockwell East is a design-led serviced aparthotel made up of 57 serviced apartments (32 studios and 25 one-beds). All apartments are designed in minimalist Scandinavian style and come with everything you’d expect in a hotel – towels, dressing gowns and shampoo etc. Each apartment’s interior is decorated with cool, contemporary artwork by Fergus Hare, gentle lighting and big windows. Kitchens are fully-functional with high-tech ovens and microwaves, Russel Hobbs kettles and modern white goods (fridge, dishwasher and washing machine). Apartments are air-conditioned/ heated and come with modern, flatscreen televisions. 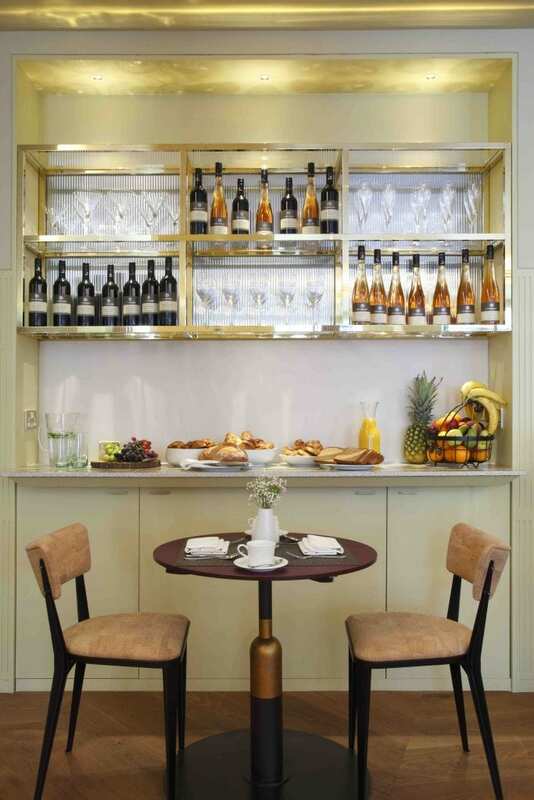 Despite being an aparthotel, Rockwell East has a small but stylish in-house café-come-dining room made up of cork and velvet furniture in warm burgundy, yellows, sepia and brandy tones, as well as a fully-functioning bar and kitchen. Room service is available and a receptionist is on duty 24-hours-a-day should you need anything. The biggest bonus for an independent traveller is the the check-in/ check-out system, which is seamless. No faffing around or waiting in queues. Staff will tell you everything you need to know (like where the air-con/heating is and how to turn on the shower) but also respect your privacy. The hotel also has an agreement with the gym next door should you wish to exercise. The breakfast is substantial and runs from 7am till 11:30 am. The buffet-style system allows guests to come and go as they please – perfect for those on business or people who independent travel. A wide variety of quality products are on offer, from fresh croissants, fruit salad, hams and cheeses to glass ramekins of mini jam and marmalade. Hot, meatier options (sausages, bacon etc.) are also on available should you want a heartier breakfast. The café is open from 7am until 12am and is exclusive to guests, meaning you’re almost guaranteed a seat. Choose from curries to Mediterranean options from the evening menu. The food is affordable and good quality, which is ideal as the closest other dining option is the Wetherspoons across the road. Ask for a room facing away from the railway line for better views and less noise (although all rooms are sound-insulated). Adam was a guest of Rockwell East. Rooms are available from £150 a night.